NOTICE: If you read this article prior to January 8, 2011, the calculations I had performed showing the effective percentages increases of various levy amounts were incorrect. An updated chart has been posted, and the numbers in this article have been corrected, as shown by strikethroughs. I apologize for my error. First, allow me to begin by saying "Thank you" to all the members of the community who participated in the Breakfast with the Board last Saturday. There were great questions and lively discussion, lasting well past when the session was formally concluded. Most of the conversations were about the cost of running our school district, what Ohio's budget crisis is going to mean to school funding, and how large the next levy will be. I hope two things were achieved during this meeting: 1) that folks learned some things about school economics that they didn't know before; and, 2) that the members of the Board heard how much the people of our community love their schools, yet are still concerned about the ever-increasing financial burden of funding its operations. We are rapidly nearing the time when the School Board will need to vote on the two resolutions required by law to put a levy on May ballot. There is a regular School Board on Dec 13 (@ Horizon), then the next two will be Jan 10 and Jan 24. The first of those resolutions will likely be on the agenda on Jan 10, and the final resolution on Jan 24, in order to meet the deadline for filing with the Board of Elections. I've recommended to my fellow School Board members that we schedule a working session soon for the sole purpose of having an in-depth examination and discussion of various funding and spending scenarios, leading to the selection of the millage rate that will be on the ballot. I have also recommended that the Audit & Accountability Committee be invited to participate in this discussion, allowing the School Board to benefit from their talent and wisdom, especially since they have spent the last two years working hard to understand the economic underpinnings of public schools. 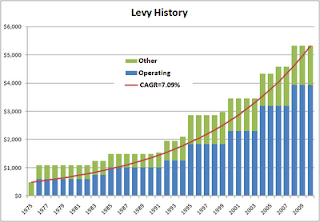 My last article included a chart that I constructed to help me understand the implications of various levy sizes. I've enhanced that chart a bit, and make it available to you - with the disclaimer that it is accurate to the best of my knowledge, but is NOT an official publication of Hilliard City Schools. Before making your decision about how to vote on the levy - whatever size it may be - read the official ballot language, and ask Treasurer Brian Wilson to clarify any questions you might have. The second column shows the amount the annual property tax will increase for each $100,000 of market value (as determined by the Franklin County Auditor). For a 6 mill levy, this number is $184/yr. So if your home is appraised at $250,000, a 6 mill levy would cause your property taxes to increase $460 ($184 x 2.5). By the way, this calculation would be the same for every school district in the State. In other words, a 6 mill levy would increase the annual property tax by $184/yr per $100,000 regardless of whether the levy is in Hilliard, Dublin, Toledo or Chillicothe. The third column shows the total amount of new revenue the District would receive should the levy pass. Looking again at the row for 6 mills, this shows that a 6 mill levy would raise approximately $14.6 million per year of new money for the District. This number does vary from district to district, depending on the aggregate property value. Again, the math isn't mysterious. The total value of all real estate in our District is about $2.4 billion, and 1 mill is a tax equivalent to 1/1000th of the value of a piece of property. So a 1 mill levy raises approximately $2.4 million per year in our District. The next columns attempt to create a sense as to what various millage amounts equate to in terms of annual rates of increase. In actuality, when a levy passes our tax bill increases in one step, and remains at that level until additional levies are voted in, or existing levies expire. So if the School Board said to the community, "we recommend that you approve a 6 mill permanent levy, and estimate that, given our assumptions as to funding and spending, we will not need to ask you for another levy for 3 years" - you would scan across to the columns for 3 years, and note that this is equivalent to a 2.6% 3.6% annual increase in just the school portion of your property tax, and to a 1.6% 2.6% annual increase in your overall property taxes (The school tax is approximately 64% of your total property tax bill. The actual fraction depends on which city or township you live in). Of course, if our assumptions are off, and the Board has to come back to your for more money in 2 years instead, it would be like raising the effective annual rate of increase to 3.9% 5.5% on the school portion of your tax bill, or 2.5% 3.6% overall. So how much does the District need, and how many mills will you be asked to pay? There is simply no mathematically correct answer to that question - it's a matter of opinion. You are welcome to look at the current Five Year Forecast, as well as a bunch of scenarios I've constructed for examining various configurations of levies vs a couple of spending rates. Very soon, the period of theory, opinion, analysis and discussion will end, and the School Board will reach a decision as to the levy amount. If you have not expressed your views on this matter, please do so right away. We would love to have you come to the next Board meeting and speak to us directly, but if you cannot, send a letter, or an email and make your voice heard. At our last School Board meeting, Treasurer Brian Wilson presented a couple of simple charts showing what the district's future cash balance is projected to be given three different levy scenarios: 6.9 mills, 8.9 mills and 9.9 mills. He developed these scenarios by starting with the most recently approved Five Year Forecast and dropping in the revenue stream that would be generated by these various levy amounts. Of course, this is from the perspective of the school district. What would these various levy amounts and funding periods mean to you, a homeowner or business owner in our district? Each row is for a different millage amount, from 4 mills to 10 mills. I'll not insult your intelligence by tacking a ".9" onto the numbers as though you don't know 6.9 mills is pretty much the same thing as 7 mills. If you pick the row for say 6 mills, the "$Incr" column shows that this would increase your property taxes by $184 per $100,000 of market value, or 7.9%. So if the Auditor has said your home is valued at $250,000, you would multiply the $184 by 2.5 and arrive at $460 for the amount your taxes would increase if a 6 mill levy were passed. The columns show what the effective annual percentage increase is based on how long the Board tells you it will be until yet another levy is placed on the ballot. If the plan is to wait for three years before asking the community for more money, then a 6 mill levy is equivalent to increasing your taxes at an annual rate of 2.6%. You can also 'work backwards' using this chart. For example, if you decide that you're not willing to have your property taxes increase at an effective annual rate greater than say 3%, look for numbers close to 3% on the chart, and see what combinations of levy millage and years yield about 3%. It looks like something between 4 and 5 mills on a two year cycle would be about a 3% annual growth rate. Or 7 mills on a three year cycle. Or 10 mills on a four year cycle. I hope this helps you gauge the impact of various levy sizes on your property taxes. The decision as to the levy amount that will be on the ballot is going to happen in December or January. If you wait around until April, the only choice you'll have is whether or not to vote for the levy. If you want to influence the Board as to the levy amount, you'll have to speak up now. The Breakfast with the Board this Saturday, November 20, from 9am-10:30am at the Central Office Annex is a great place to make your voice heard. Come any time during the hour-and-half gathering, speak your mind and leave, or stay the whole time if you like. Just don't be silent and expect things to come out the way you want. "The district also shaved $6.5 million in expenses through staff reductions, department budget cuts and efficiency improvements since 2008." I believe this quote merits further explanation to make sure the folks of our community understand what it means. So what does the use of the word "shaved" as in this Dispatch story mean? Therefore $6.4 million less was spent during 2008-2010 than had been forecasted in Decmber 2008. This is where the "shaved $6.5 million in expenses" comes from (please excuse the rounding differences). So one way to talk about "savings" or "cuts" - the way reflected in the quote reported by The Dispatch - is to compare what was actually spent vs what we had thought we were going to spend, given the assumptions made at that time. From that perspective, spending was indeed around $6.5 million less for this period than what we had planned. However, in absolute terms, our spending increased at a rate of 3.6% per year even after all of those programming cuts and staff reductions had been made. Looking forward, the latest Five Year Forecast shows annual spending increasing from $157m in FY2010 to $191m in FY15, a compound annual growth rate of 4.0%. During that period, Compensation & Benefits costs are projected to increase 4.45% per year. I leave it to you to decide whether there has in fact been a "savings" when spending grows, but at a rate less than forecast. The objective of this article is to point out that the word "savings" is ambiguous, so don't assume that what you read or hear reported is the same thing you are thinking. Ask follow-up questions until you fully understand what is being said. The Columbus Dispatch chose to distill my comments at last night's School Board meeting down to a tiny sound bite that left the reader with no idea what I'm thinking. Below is the full text of my comments. I have spent the last two days at the annual Ohio School Boards Association annual conference attending every session I could that dealt with school economics. The primary question on everyone’s mind – from all across the State – was how much the Governor and General Assembly are going to cut the funding to schools. There was no question about if there would be significant cuts, and no one thought it would be less than 10% - the number Brian has used in the Five Year Forecast we just accepted. More than a few thought it would be more. Assuming that we all agree that we desire to maintain the excellent quality and breadth of programming and services offered by our school system, it seems that we have two primary things to discuss. First is whether we want to stick with this assumption of a 10% state funding cut, or perhaps increase it, and what kinds of contingencies we want to put in place in case we are wrong. A big part of this is deciding how aggressive to be in raising our cash reserve back to 10%, as is Board policy. That’s not free – it will take mills to achieve this. Secondly, this has to be a conversation about the cost of compensation and benefits for our excellent team of teachers, staff, and administrators. Comp & benefits consumed 87% of our operating budget last year, and is projected to reach 89% of our budget by FY2015. We can and must continue to seek ways to save money in the other 12% of our budget, but there will be no way to work our way through these economic times without dealing strategically with comp & benefits. It is a time when both sacrifice and investment are necessary. When we next put an operating levy on the ballot, we will be asking the already stressed homeowners and businesses of our district to increase their investment in our schools. It will be burden on them, and they will not be inclined to support a levy unless convinced that it is absolutely necessary – after we have taken steps to minimize spending. And recognizing the base and step freezes the whole body of employees have agreed to for 2011, I believe we also need to ask the employees of our district to continue to share in the investment necessary to preserve all the great things they have achieved over the years. We can use all kinds of euphemisms in this discussion, but the question comes down to how many people will be employed, and what will be the collective cost of their compensation and benefits. I reject the notion that the only tool available to us is the broad axe of layoffs and the attendant cutting of programs. I attended a discussion this week about Early Retirement Incentive Programs. I don’t know that such a program would make any sense for our district or for our employees, but it seems like we need to run the numbers and find out. And there are no doubt many other options to explore if we can do so in the spirit of coming together to solve a shared problem in what is soon going to become a statewide climate of fiscal warfare. Thanks to all those who attended this session, and especially those who came forward during the time for public participation. I hope that many more attend the Breakfast with the Board on Saturday morning, November 20, at the Central Office Annex. Come any time between 9am and 10:30am and let both your school leaders and other community members know what you think about a levy on the ballot this coming May. While the School Board has not yet had a discussion about when the next operating levy will need to be presented to the voters, I expect that the decision will be made to put a levy on the ballot in May 2011. The question will be the size. The first of these discussions is on the agenda for the Board meeting scheduled for 7pm next Wednesday, November 10, 2010 at Darby Creek Elementary School. I believe that this is one of the most significant topics that must be dealt with by the School Board, and getting the opportunity to be part of this discussion is frankly one of the primary reasons I ran for a seat on the Board. There is a time for public participation at the beginning of each Board meeting (see the agenda for the rules). I hope many members of the community take advantage of this opportunity, especially on this topic. The “Pricing” Approach: Proponents of this approach think first about maximum size levy the community is likely to bear. In other words, how large can a levy be and still garner a simple majority of the votes on Election Day? How the money will be spent is secondary to those of this mindset. The “Cost” Approach: Proponents of this approach believe that the levy amount should be determined after making decisions about how we are going to change our spending in the coming years, and making assumptions about what may be altered in our revenue sources. It should be no surprise to readers of this blog that I come from the second school of thought. This requires an iterative method of analysis, because as is the case in every budgeting exercise in which I have participated over the past 30 years, the first pass never makes sense. Perfectly reasonable assumptions about how much we would like to spend, and plausible projections about where the money would come from, inevitably lead to revenue requirements that are ridiculous to consider. So you have to adjust the spending forecast downward, reexamine the revenue projections, and tweak the parameters until something reasonable emerges. The sooner we plan to put the next levy on the ballot (the shorter the interval), the smaller both this and the next levy can be. Conversely, the longer we want the interval to be until the next levy, the larger both this and the next levy must be. Then there is one other element which affects levy size and timing – the condition of our cash reserve. While spending tends to increase at a constant rate, the portion of our revenue that comes from property taxes rises in large steps each time a levy is passed, then stays relatively constant until the next levy is passed. In the first year or two after a levy passes, the revenue is greater than the spending, and our cash reserves increase. Then at some point, spending rises above the income and the cash reserves are drawn down. This phenomenon is just like what occurs in your personal checking account. You spend a little money every day, causing your account balance to gradually decrease. Then payday comes along, and in one step, your account balance jumps back up, and the cycle repeats. So we get to decide whether we should be trying to live hand-to-mouth as a school district, allowing the cash balance to get as low as possible, or whether it is better to keep a little money in reserve so we have some ‘wiggle room’ to deal with the unexpected. On August 14, 2006, the Hilliard School Board adopted Policy DBDA, which states that “maintaining a cash reserve balance of 10% of operating expenses is necessary in the interest of sound fiscal management.” I wholeheartedly agree with this. It is not good a good thing to have nothing in reserve. The ‘unexpected’ stuff on our horizon is indeed scary. I’d go so far as to say terrifying. It didn’t really matter who was elected Governor this week, the State of Ohio is in deep doo-doo from a fiscal standpoint, and there are going to be spending cuts of a magnitude such that no one or no program will be unaffected. So what is the effect on our community if the new Governor and General Assembly decide to cut education funding by 10%? That would decrease our State funding by more than $5 million per year, the equivalent of about 2 mills of local property tax revenue. Just to stay even. Note that the $8 billion gap in the upcoming biennial budget represents 16% of current spending by the State. So if education gets hit with only a 10% cut, a disproportionate amount of the cuts will have to come from Medicaid, the prison system, and property tax relief programs (e.g. the Homestead exemptions). There are no easy choices. But carrying this picture to the next step, it is not necessarily true that even if the Governor and General Assembly decide to make a 10% cut across all education budget lines, that the impact will be spread evenly across all school districts. Let’s face it – the folks at the Statehouse believe districts like ours have the local capacity to fund our schools however we want, so it is not hard to imagine that the impact of a State funding cut would be distributed in proportion to the perceived wealth of a school district. That is, the more wealthy the district, the deeper the cut. The above-noted Dispatch article reports that “some local school leaders are preparing for cuts of 10 to 15 percent.” Our District Treasurer, Brian Wilson, baked a cut of 10% into the just-approved Five Year Forecast. We may be being optimistic. One way to prepare for such cuts is to put a little extra money in the piggy bank to give us some time to react when we find out what the real depth of the cuts will be. For that reason, I advocate having a part of our next levy dedicated to maintaining a 10% cash reserve. Readers of this blog also know that we spend nearly all of our budget on the compensation and benefits of our great team of teachers, staff, and administrators. The current Five Year Forecast shows the FY2011 portion to be 88%, growing to 89% by FY2015. There are no doubt a number of nice-to-have budget items that we can reduce or eliminate, still a little efficiency to be gained, and there’s a lot of that which has taken place over the past several years. But it’s now time that we have to talk about compensation and benefits. I am not at this time advocating pay cuts. But we may have to cross that bridge if the State of Ohio really sticks it to us as the State leaders try to figure out how to dig Ohio of this mess. In fact, I believe that any radical reduction in State funding has to come paired with the authority to bring the employee unions back to the table to renegotiate their collective bargaining agreements as needed to keep our district solvent. Over the past several weeks, I have developed a number of spending/levy scenarios that I could use to try to understand some of the many options the Board might consider (copies were sent to the other Board members, Superindent and Treasurer, as well as to the members of the Audit & Accountability Committee). None of them are pretty. Scenario #1 shows that to fully fund the spending indicated in the Five Year Forecast with a levy in 2011 and then again in 2014 (3 year interval), the levy would need to be on the order of 11 mills. I’m quite sure that’s a non-starter, so something has to be adjusted. Scenario #2 shows that if we drop the levy interval back to 2 years (2011, 2013, 2015), the size of the levy would still need to be on the order of 9 mills. I don’t think that would fly either. In fact, Scenario #3 shows that if we passed a levy every year, it would take nearly 6 mills each time to cover the spending as has been forecasted. Clearly we have to start looking at reducing the rate of spending growth, and that means the rate of compensation and benefits growth. Scenario #4 shows comp+benefits growth limited to 2% per year, adjusted by the forecasted growth in students. A 2% annual growth rate in comp+benefits is about what it takes to cover the current step increase schedule as long as base pay continues to be frozen. 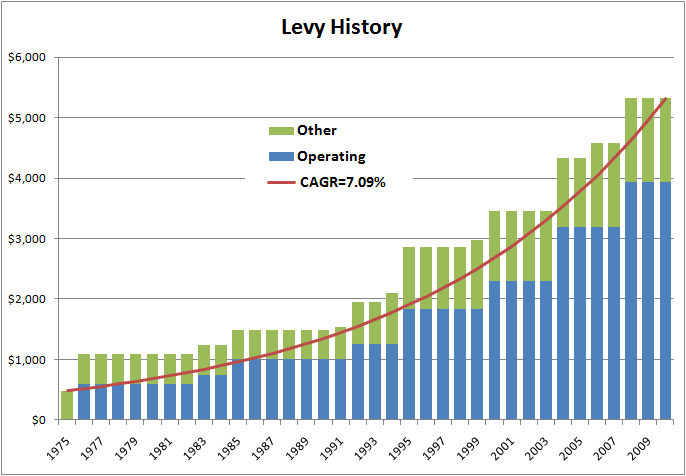 With a three year levy interval, the size would need to be 8 mills in 2011 and 2014. That’s still a pretty big gulp. It’s maybe something the community would have bought into had we spent the last few years better educating our community about school economics – something I’ve been harping about for a very long time. But I don’t think there’s much of a chance of passing an 8 mill levy given the general lack of understanding about these matters. So Scenario #5 also looks at limiting comp+benefits growth to 2% per year, but assumes that a levy is passed every two years. In that case, each levy would have to be on the order of 6.5 mills. Scenario #6 looks at an annual levy schedule, and shows that it would have to be 4 mills each year. Scenario #8 asks this question: If we wanted levies to be no more than 5 mills, and no more frequent than every three years, what is the rate of comp+benefits cost increases that can be supported? The answer is 0.6% - essentially frozen at today’s cost. No base pay increases and no step increases. We would also have to talk about how to apportion increases in health care costs. I reject the assertion that the only choice available to us is to fully fund the Five Year Forecast as presented, or to suffer programming cuts. However, this is exactly the choice that has been presented to the community in the past. There is another range of solutions that involve examining ways to preserve staffing levels and programs (which are nearly synonymous) yet lower costs. One of those is to look at the possibilities for lowering our per-headcount cost. 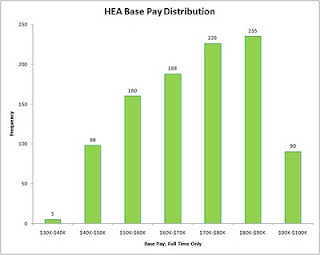 This is a histogram showing how many HEA members were in various base pay bands as of January 2010. 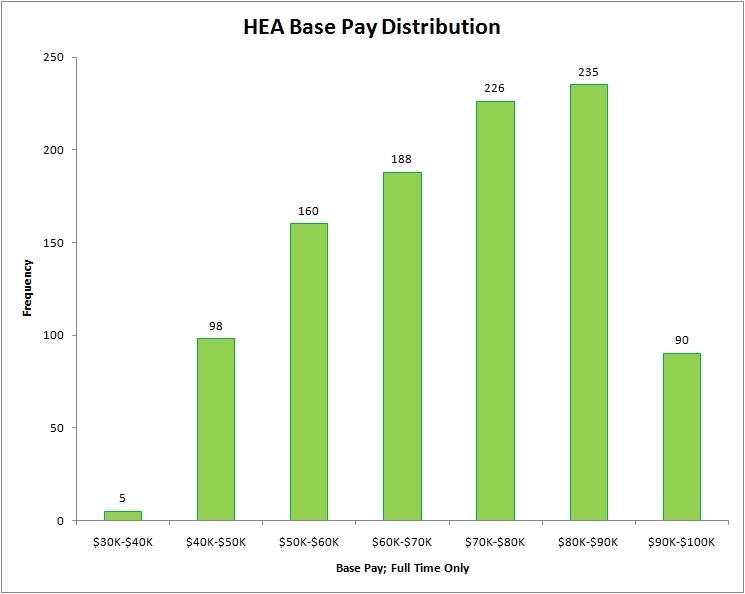 You’ll notice that 55% of the HEA members are paid $70,000/yr or more, and 32% are paid $80,000 or more. Is it possible that we could, jointly with the HEA, create a buy-out program which could make sense for everyone, allowing highly paid teachers to be replaced with teachers at the beginning of their careers (and there are lots of them looking for jobs right now)? The State Teachers Retirement System doesn’t make this easy, but there are changes on the horizon for STRS that may open a short-lived window that could motivate teachers near retirement to be willing to accelerate their retirement given the right deal, which would also have to be one that makes sense for the school district. We have to run the numbers and find out. The conversation this time around has to be more involved than “pass the levy or we’ll cut extracurriculars and busing.” The discussion at the next Board meeting will be a start. I hope you will come and participate. Bexley's levy passed by a considerable margin for a school levy, but Bexley is an affluent community and generally gives the schools what they ask for. Same thing for Grandview Heights. Madison Plains passed their renewal, which keeps their tax burden the same (ie - their taxes would have gone down had the levy failed). Notice that they put a time-limited levy on the ballot again, meaning that the taxpayers will in three years again have a voice whether to keep sending this amount of money to their schools. I think that increases accountability and forces better communications. Good for them. Interesting that neither Gahanna nor Pickerington passed their levies. Those communities are much like Hilliard - rapidly growing, relatively affluent bedroom communities without much growth in their commercial tax base to help fund the schools. That means the homeowners are bearing all the burden of growing personnel costs. The question now will be how the leadership of those districts will deal with the defeat of the levy. Will they just grit their teeth and try again to push it through? Will they punish the community with program cuts and service cuts? Will they approach their unions to see if they can get concessions that will allow a smaller levy to be put on the ballot? I encourage you to read this excellent article from the Fordham Institute. It succinctly summarizes the key economic issues affecting Ohio's public education system. Our community needs to be talking about this in the next couple of months, before the Board decides - in January - if an operating levy will be on the May ballot, and how large it will be. At tonight’s meeting, the Board of Education approved an update to the Five Year Forecast as published by Treasurer Brian Wilson. Click here for a copy. I consider the Five Year Forecast to be one of the most important documents published by the Treasurer. It gives the Board, Administration and Employees – and the community – insight as to how the Treasurer sees things going from an economic perspective. Money isn’t the most important thing for a school district to be concerned about, but it’s the gas in our tank. No matter how good the race car, the driver, and the crew, you can’t win the race if you run out of gas. The fuel strategy is critical for an auto racing team. They have to figure out how to run fast enough to have a chance of crossing the finish line first, but yet not run so fast so as to burn fuel at a rate that forces them to make pit stops for gas too frequently, which costs time and position. It’s impossible to win a race without a good fuel management strategy. Same thing with a school district and money. Our financial strategy has to be a combination of management of the rate in which we consume cash, the frequency in which we can ask for more (via an operating levy, which takes an emotional toll on the community), and yet staying near the head of the pack in terms of the quality of the educational experience enjoyed by our kids. Tonight, we are considering the approval of a Five Year Forecast to deal with a technicality* associated with executing the 1 year extension of the contracts with the Hilliard Education Association and OAPSE. The Board still needs to have a discussion about whether there will be a levy on the ballot in May – I believe there will need to be – what size that levy will need to be, and how it will be structured. While projected growth in student population is always a concern, I believe that in this next levy cycle the two factors that will be most significant in our planning are – first – how funding by the State of Ohio may change, and – secondly – the pace in which we will allow our spending to grow. We have little control or even influence over how the leaders of our State will choose to deal with a revenue vs spending gap that is on the order of $8 BILLION in the next State budget. We hope to learn more about how the wind is blowing during the annual meeting of the Ohio School Boards Association in a couple of weeks. But the rate in which we allow spending to grow IS something we can address within our community. It’s largely a conversation about compensation, benefits, and headcount, and will require all of our stakeholder groups – parents, employees, homeowners, businesses, and the municipal governments – to engage in a well-informed, empathetic and respectful dialog about how to go forward in an economic and political climate that seems destined to shift more and more of the public school funding burden to the suburban communities. I look forward to having that conversation. The Breakfast with the Board which Lisa has organized is a great opportunity for the people of our community to ask questions and make their views known. * The technicality is that Ohio law prohibits a School Board from signing a multi-year agreement which spans a year in which the Five Year Forecast projects a negative cash balance. In the prior Forecast, this was the case with FY12, because the one year contract extensions signed by the two unions reach into FY12. Therefore a slight adjustment has been made so as to show the FY12 year end cash balance to be zero. Notice is hereby given; there will be a SPECIAL meeting of the Board of Education of the Hilliard City School District on SATURDAY, NOVEMBER 20, 2010 from 9:00 A.M. until 10:30 A.M. located at Hilliard City Schools Administration Annex, 5323 Scioto Darby Road, Hilliard, Ohio. The meeting will be informal conversation in which community members are invited to sit down with board members in a casual setting to share ideas, express concerns or ask questions concerning the school district and no further business will be transacted. At tonight's meeting of the Hilliard Board of Education, the Board voted unanimously to accept an agreement with the members of OAPSE* that will freeze their base pay and step increases for calendar year 2011. During the discussion of the motion, I thanked the OAPSE members for joining the HEA in taking a 'time out' while we all wait to see how our state leaders - whomever they turn out to be - figure out how to deal with the state budget disaster looming before us. Well done to Superintendent Dale McVey and his team for leading this process. This article was prompted by a recent posting by Colleen Grady of the State of Ohio Education blog. It won't be long now before school opens for the 2010-2011 school year. Of the many traditions which will be carried out in the first few days, one troubles me: the imposition of fees on our students and their families. At the May 24, 2010 Regular Meeting of the Board of Education, resolution 64-10 was passed unanimously, authorizing the Administration to collect a long list of fees for various academic courses. I voted in favor of this resolution not because I think these fees are a good thing, but rather because I couldn't see any way before the start of the school year to replace the approximately $1 million that is collected through the fee program. However, during the discussion time for this resolution, I made the comment that I wish such fees didn't exist, and that I would like to see the Board and Administration explore a budget that does not require such fees. No student in our school district escapes fees. The PreSchoolers each pay $15/yr, and Kindergarten through 6th grade kids pay $30/yr. At 7th grade it bumps up quite a bit, to $73, adding on fees for Arts, Social Studies and Physical Education uniforms. The 8th grade fees aren't so much, but kid have to pay to take foreign languages (from $14 for French to $22 for German). At the high school level, the fees a student pays are directly related to the courses scheduled. The fee amounts range from $4 for Astronomy to $120 for a course called "Liberal Democracy in America" (see High School Program of Studies, page 58, and the Kenyon College syllabus for the course). Across a population of 15,000+ students, to collect $1 million/yr in fees means about $60/kid. But about 70% of our students are in kindergarten to 8th grade, where the fees are $30-40/yr. This means the high schoolers are each paying on the average somewhere around $140/yr in fees. Here's my problem with these fees: We're either a public school system, or we're not. Public school districts are granted an exclusive service territory by the State government. Every square inch of Ohio is part of some public school district. Where you live determines which school district you are a part of. The only way you can change your assigned public school district is to move. This is my first point of concern. Elizabeth Warren once said that one of the reasons Americans have pushed themselves so much into debt is that the price of admission to a good school district is an expensive house. I think this is a profound observation, and more people need to hear and understand it. It is no longer legal in America to segregate or discriminate based on race, creed, color, age or gender, but we can and do certainly discriminate based on wealth. By the way, before you hang any particular pejorative labels on me because of that statement, please understand that I believe that appropriately regulated free market capitalism is the best way to address most economic questions. Less government, not more. If you have a child of compulsory school age, you are required by law to send that child to the public school or a chartered nonpublic school (e.g. parochial schools). However, only the public school districts have the authority to levy taxes to fund their operations. Public charter schools are eligible to receive State funding. Chartered nonpublic schools receive no tax-originated funding. If you own property, you pay property taxes to the public school district. If you are a renter, your landlord pays property taxes on the property you live in and passes the cost on to you. A number of public school districts also levy income taxes on its residences. You can't opt out of these taxes by claiming you don't have kids, or that your kids attend a chartered nonpublic school. The State of Ohio collects income taxes, sales taxes, commercial activity taxes, etc a redistributes some of that money to all the public school districts in Ohio. This topic is substantial by itself. For the purposes of this article, let's leave it that this money is redistributed from districts with high recognized land values to districts with low recognized land values. The net of this is that everyone lives in a public school district and everyone pays taxes to operate them. Like it or not, that's what we've got right now. So I don't understand the purpose of these fees which are levied on students. It seems to me that they are just an additional tax levied on only those with kids. So which is it: everyone chips to operate our public schools, or only folks with kids? Seems like we have a little of each. We collectively allowed this tax to sneak into the system, misdirected perhaps by having them labeled as "fees" instead of "usage taxes." "The Benevolent Fund has been put in place to offer financial assistance to Bradley students in need. These funds will be made available when no other community resources are obtainable. Our goal is to help our students whose needs have fallen through the crack." Specifically, it says that money from the Fund may be used to: "help pay other fees that may prevent a student from an opportunity for success here at Bradley High School." The bottom line is that I think we should end the practice of collecting academic, athletic and activity fees, and instead fold these expenses into those which are paid via our normal tax-supported revenue sources. If the current fees total $1 million per year, we would have to raise our taxes by four tenths of a mill to cover the amount ($13/yr per $100,000 of home value). Or we could reduce other expenses by $1 million (remember that 88% of our expenses are compensation and benefits). What are your thoughts? You can let me know via comments here, or you are welcome to send an email. Hope you like the new layout. Maybe a little easier on the eyes. As readers of this blog well know, the labor agreements between Hilliard City Schools and the unions representing most of the employees will expire on December 31, 2010. The compensation terms negotiated into the new agreements will be the major factor in determining the size and timing of the next operating levy. Actually, because our labor agreements typically span several years, they may well determine the size and timing of the next two levies. It may be worth a moment to review the compensation structure defined in these labor agreements. I'll focus on the agreement with the teacher's union – the Hilliard Education Association (HEA) – as it has the simpler structure of the two agreements (click here for a discussion of the OAPSE agreement). 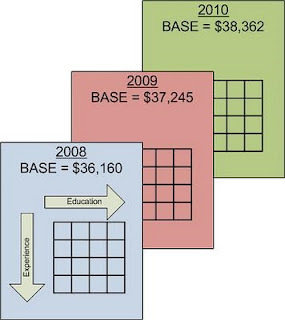 As the illustration above shows, the compensation structure can be thought of as three-dimensional. For each year, a base salary is set: in 2008 for example, the base teacher salary was $36,160. This represents the salary that would be paid to a teacher with a Bachelor's degree and no experience. From there, a grid is developed in which the columns represent greater levels of education for the teacher, and the rows represent years of service. The HEA agreement has columns for Bachelor's Degree, Bachelor's Degree and 150 total credit hours, Masters Degree, and Masters Degree plus 15 additional credit hours. As one works across the columns, the 2008-2010 HEA Agreement specifies that the salary goes up 6% for each educational level. So in 2008, a teacher starting with a BA and no experience would have been paid $36,160 – the base salary. If that teacher had a BA with at least 150 total credits hours, the pay would have been 6% more, or $38,330. If that teacher had a Masters degree, the salary would have been another 6% more, or $40,499. And finally, if that teacher had a Masters degree plus 15 hours of additional credit, the salary would have been $42,669 – another 6% more. Note that the degree requirements for each column are not uniform across all school districts. Some have more columns, and some grant additional compensation for higher levels of education, such as Masters plus 30 hours, or a PhD/EdD. Nor is the size of the increase granted for each educational level uniform. Ours happen to be 6% for each level, but other districts have smaller or larger increases specified in their contracts. The rows specify the additional salary paid to a teacher for years of service. These are customarily called the step increase. As is the case with the columns, step increases are uniquely defined in each school district. The HEA contract is pretty simple – an additional 4.15% is granted each year through 15 years of service, then again in the 20th and 23rd years. After the 23rd year, there are no further step increases, meaning that the only way for our more senior teachers to receive a salary increase is to add to their educational level, or to have the base pay increase. Currently, about 65% of the HEA members receive step increases – the other 35% are in a year of service in which no step increase is specified. It is important to note that the base pay increase and step increase compound to arrive at the final salary for any particular year. For example, a teacher with ten years of experience in 2003 became a teacher with eleven years of experience in 2004. Using the historical numbers above, a teacher with ten years of experience in 2003 would have been paid 8.06% more in 2004. Taken directly from the contracts (available here), the 2003 pay of a ten year teacher with a Masters degree would have been $51,187. In 2004, that same teacher – now with eleven years of service – would have been paid $55,310, an increase of $4,123. One more example: A teacher with a BA and 7 years of experience in 2002 would have been paid $38,991. In 2010, that same teacher would have 15 years of experience, and would be paid $70,598. This is equal to annual raises of 7.7% in each of the years between 2002 and 2010. Ohio's current teacher licensing requirements mandate that a teacher must begin graduate studies no later than the fifth year of teaching, and must earn a Masters degree by the tenth year. So let's modify this scenario to take the educational level into account as well. Assume once again that the teacher in 2002 had a BA and 7 years of experience. Then in 2004, the teacher would reach the BA+ level. That would have meant that in the 2004 the teacher would have received the 3.75% base pay increase, the 4.15% step increase, and the 6% increase for advancing in education. This would put the teachers' 2004 pay at $46,333, or 14.5% over 2003. By the 15th year of service in 2010, this hypothetic teacher would have a Masters degree, and the salary would be $79,072. 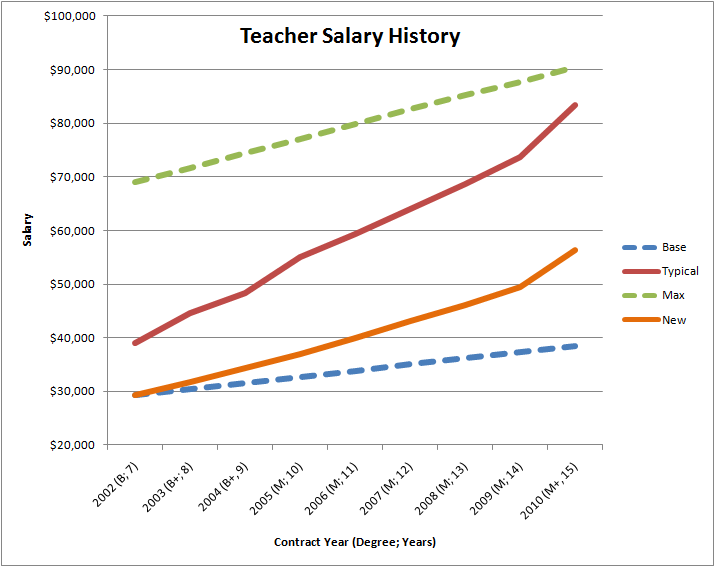 During the span of years between 2002 and 2010, this teachers' salary would increase at an annual rate of 9.24%. Because the entire pay grid is derived from the base salary, when the base salary increases, so does the maximum salary. In 2002, the maximum salary was $69,092. For 2010, the maximum salary is $90,362. The chart below depicts the base pay, maximum pay, and two scenarios. The line labeled "Typical" is for a teacher who would have had a BA and 7 years of service in 2002, and reached MA+ level in the 15th year, 2010. The line labeled "New" is for a teacher who began the first year of teaching in 2002 with a BA, and reaches BA+ in 2010. One other compensation change which needs to be mentioned relates to the cost of health insurance. In the 2008-2010 contract, the union employees agreed to pay part of the premium for health insurance. Prior to 2008, the employees made no contribution at all to the cost of health insurance. For 2010, their contribution is 10% of the actual premium, or $122.10 per month (capped at $135.52/mo) for family coverage. Teachers do not participate in Social Security, and instead have their retirement benefits paid by the State Teachers Retirement System. Contributions to fund STRS are made by both the teacher and the school district with the teacher is working. Currently, the teacher contributes 10% of their salary, and the school district contributes another 14%. The fiscal stability of STRS has been called into question, and the proposals being made to 'fix' the system include an increase to the contribution rate for both employers and employees. The timing and amount are yet to be worked out, but the proposals suggest that the employer – the school districts – and the teachers will each be asked to contribute an additional 2.5% of salaries on a schedule to be phased in over five years. Overall, the benefits for employees add another 34% of salaries. In May, Treasurer Brian Wilson updated our Five Year Forecast. In constructing this forecast, he assumed that there would be no base pay increase for the years 2011-2013. However, the total salary expenditure for the current employees would still increase 2.3% each year due to step increases, assuming the current step formula is used. In 2011 - the coming school year - he assumes there will be a net reduction of $700,000 in salaries - presumably through layoffs. For 2012 and 2013, he is assuming that we will add a net $200,000 in new employee salary dollars each year. In 2013, an additional $1 million in new salaries are assumed to be required to hire sufficient teachers to provide full-day Kindergarten, as mandated by state law. Adding on the cost of benefits, and Mr. Wilson forecasts that our total cost of compensation, which was $131 million in 2009, will rise to $155 million in 2013 - an increase in annual spending of $24 million. The levy math is straightforward: Each additional mill of property taxes generates $2.4 million more money for the schools, and costs $30/yr for each $100,000 in home value. If our spending is going to increase by $24 million/year, then by 2013 we'll need 10 mills of additional property tax income - or $300 more for each $100,000 in home value - to fund it. However, we can't wait until 2013 - the Five Year Forecast shows the District running out of cash in 2012, and so as has been reported in the news, an operating levy request is very likely to be on the ballot in 2011. On top of this, there are real concerns about the stability of our funding from the State of Ohio. We already know that the State will be reducing our funding by $12 million/yr as they phase out the reimbursement for the elimination of Tangible Personal Property tax. Replacement of that alone would require 5 mills of new property taxes. Our FY10 and FY11 revenue includes close to 1 mill worth of funding each year from the Federal stimulus money. That too will have to be replaced if we want to spend at forecasted levels. There has been no time in recent history when the fiscal future of our school district was less clear. As a community, we need to figure out how much we're willing to pay in additional property taxes to fund the operations of our schools. If your answer is zero, then please offer suggestions for what needs to be cut to reduce spending. Opinions without basis in fact or understanding don't help. For example, one thing I hear often is a variation on this theme: "What about all those big school buses that run past my house carrying only a few kids?" I tell people who say this that if they followed those buses a little further, they would be completely empty! Designing a transportation system that moves thousands of kids from their neighborhoods to all the various schools in a reasonable period of time while keeping costs minimized is a complex task, and I think our transportation team is pretty good at what they do. To be sure, there is always a way to reduce spending in a budget as large as this. But when nearly 90% of the spending is for salaries and benefits, any real cost reduction has to come from reducing pay increases and/or employing fewer people. This is why the upcoming union contract negotiations are so critical to the health of our school district. Adding to the challenge, the State of Ohio may yet surprise us with further funding cuts. We should begin to think now how we will apportion this risk among the stakeholders of our district, including students, employees, suppliers and taxpayers. No one group - e.g. the taxpayers - should bear the full weight of this risk alone. The opening presentation of this year's annual Board Retreat was that of the Board's Audit & Accountability Committee. The Board established the Audit & Accountability Committee in the Fall of 2008, during the period leading up to the vote on the 6.9 mill Permanent Operating Levy, which was passed in November 2008. The members of the Committee were named in February 2009, and they have been working very intently on their assigned mission, meeting much more often than is specified in their charter. Page 2: In conclusion, while the Audit and Accountability Committee commends the District for reducing costs per student for 2009, the past expense growth rate significantly above CPI rates is not sustainable. Page 3: The rate of growth in costs is simply not sustainable nor supported by current economic factors. Page 5: As we indicated in our previous report and again in this report, the current rate of expense increases is unsustainable. In summary, compensation expense is the driving force of education costs in all districts. In HCSD compensation currently comprises over 87% of total District expenses. While it is important that the Administration continually watch all costs, compensation expense for Administrators, teachers and support staff is the only expenditure that "moves the needle". As the District works through the difficult economic circumstances and the strategic matters raised in this report, we recommend that all employees of the District participate in the development of solutions. Equitably sharing the duty of implementing solutions, financial and otherwise, will be important to community acceptance. This is a wise and accurate summary, in my opinion. There is no single cause for the fiscal challenge in which we find ourselves, nor is there an easy solution. While it is indeed true that compensation costs make up most of the budget, and that our costs have been going up at a rate much greater than is typical in our current economy, there are other significant factors at play as well. The most significant of those 'other factors' is the fiscal maelstrom in which the government of the State of Ohio finds itself. Ohio is not alone. The cover story of Time Magazine this week (Vol 175, No. 25) is titled "The Broken States of America." The writers examine the growing number of states that, if they were private sector industries, would be inclined to declare bankruptcy in order to shed the obligations accumulated from a generation-long spending spree. Those obligations cannot be met without implementing incredibly severe cuts in current and future spending, and raising taxes to a point that could choke off our fragile economy. Because so much of the State's revenues come from personal and commercial income taxes, when the global economy took a dive, the revenues of the State of Ohio fell dramatically as well. Regardless of the pro-education promises Gov. Strickland made as a candidate, there just isn't enough money coming in for the State to honor all those expectations. The State must cover the ever-growing cost of Medicaid, as well as run the corrections system, which are also primary consumers of State funding. The result has been a manipulation of the public school funding formula such that districts perceived to be 'wealthy,' as is ours, have been left to fend on their own. In plain English, that means that 100% of the incremental costs of running our school district are being fully borne by the property owners of our community – homeowners and businesses alike. There are those who argue that the solution is obvious: radical reductions in the rate in which salaries and benefits are rising. The A & A Committee report says it clearly – only the compensation cost component of our budget is large enough such that a change in the rate of growth will make a real difference. I have certainly saying this for a very long time as well. "The District and community must remain cognizant, however, of the effect on the quality of education provided to students in taking any measures to reduce the growth in costs." In other words, this isn't a dialog concerning only cost management. We are proud of what is accomplished in our schools, sometimes with national recognition, as was just recently the case with our being named one of 174 "Best Communities for Music Education" in the country. As we go about solving the fiscal problems that face us, few want that to come at the expense of the quality of our schools. One of the key tactics Gov. Strickland has used to reduce expenditures at the State level has been to lay off one in twelve State workers, in addition to reductions in work hours and mandatory furloughs. This is hardly what one would expect from a Democratic governor, but like our schools district, it is just about the only real choice he has. 1. How much more do we want to increase our local property taxes? As you can see from the following chart, we taxpayers have voted to raise our property taxes at a rate just over 7% per year - since 1975. However, as time has passed, the interval between levy requests has shortened. While through most of the 1970s and 1980s, levy requests were seven years apart, we have passed new Permanent Operating Levies in 2000 (4.3 mills effective), 2004 (8.1 mills effective), 2008 (6.9 mills effective) and will have another one on the ballot in 2011. The size is yet to be determined. 2. How much do we want to pay our teachers, staff and administrators? 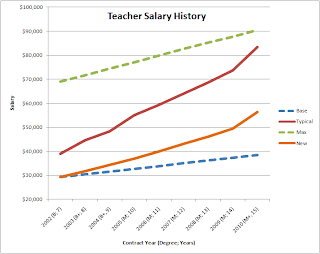 I have written much about teacher compensation – this article might be a good place to start. According to the CUPP Report generated by the Ohio Dept of Education, our classroom teachers in 2009 had an average salary of $64,703, which ranked 29th highest in the State among 614 districts. Is that too much, too little, or about right? There will be no unanimity in the answer by any camp – neither teachers, staff, administrators nor the voters. Nonetheless, it will be negotiated this Fall, in secrecy, to a definite answer which will be expressed in new union contracts for teachers and staff, and individual employment contracts for administrators. If you want to have any influence over this answer, you need to speak up now – right now – before negotiations commence. After negotiations end and the contracts are ratified by the unions, the only decision point remaining will be whether or not the School Board accepts the contracts. 3. To what degree will we accept cuts in programming, services, and staff?After the union contracts have been negotiated and signed, and the vote taken on next levy, the only knob remaining is how many people we employ. As pointed out by the A&A Committee, the only class of expenditures we have that will 'move the needle' is personnel costs. There is simply no way of enacting millions of dollars in spending reductions without layoffs. And because the union contracts specify that employees are laid off starting with those with the least seniority – and therefore the lowest pay rates – it can require a large number of them to be laid off to reach a cost reduction target. For example, my analysis suggests that to reduce spending by $1 million/yr, at least 30 employees would need to be laid off (15 FTE). To reduce spending by $10 million/yr would require on the order of 200 to be terminated. At those levels, painful choices will have to be made. Which extracurricular programs and elective offerings will have to be eliminated? What services will be discontinued? How many more kids will we have in each classroom? Reaching an acceptable balance of these three factors is quite frankly the most important task our community must undertake in the next few months. In most ways, our schools define our community. The perceived quality of the schools is why we have chosen to live here, and is a significant factor in the preservation of our property values. Simultaneously, the compensation level we agree to for our school employees is the primary determinant of our property taxes, and every increase makes it harder for people to afford to live here. I suspect that for things to work out, the school employees will have to accept less than they might like, and the voters will need to accept that they might need to pay more than is comfortable. We can reach a reasonable agreement if the people of the community engage in the dialog, and the conversation remains respectful and empathetic. Do you think we can do that without work stoppages, threats of strikes, name calling (on both sides), punitive program cut lists, and all those things which draw our children into the fray? If it's really "all about the kids," let's show them how the people of one of the best school districts in the country figures out these tough problems. Wouldn't that be a wonderful gift to them – to show them how a community successfully deals with these situations, versus the 'scorched Earth' outcome we see in so many other places.